A humidifier transforms water into airborne moisture to help add humidity to the air surrounding it. This can have several benefits to your health, including relieving irritated respiratory systems, eyes and skin caused by excessively dry air. 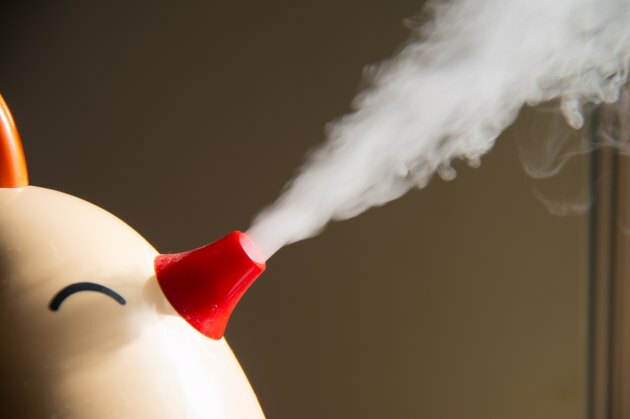 But using a humidifier is not without its potential cons and drawbacks. Knowing exactly what negative effects a humidifier may have can help you make an educated decision regarding its appropriateness for your home. Some humidifiers are very noisy. According to the editors of "Consumer Reports" magazine, some machines may have noise outputs of 50 decibels or louder. This can be problematic in quiet areas such as a bedroom, where the appliance may disrupt your normal sleep patterns. Running a humidifier constantly will elevate your home's perpetual humidity levels. Such a humid environment is ideal for the growth of mold and mildew on your walls, ceiling and upholstery. Humidifiers are a common factor in household mold growth, warns the U.S. Environmental Protection Agency, which advises against using them if your home or room doesn't have good ventilation. If your device has a humidistat—a gauge that automatically shuts down or turns on the device depending on the surrounding humidity—the EPA says to set it at a humidity level of 30 to 60 percent. Warm-mist humidifiers use heating elements to turn water into steam, which is then dispensed throughout your home or room. This heat factor can create a burn and fire risk, according to the University of Wisconsin-Stevens Point Wellness Center. Similarly, "Slate" magazine doesn't recommend using warming humidifiers if you have small children. Safer options include ultrasonic humidifiers and cool-mist humidifiers. All humidifiers use a water tank from which the device draws its water to dispense. Health Canada, a department of Canada's federal government, warns that bacteria may grow and multiply in this sitting water. Regular cleaning and sanitizing, following the manufacturer's model-specific instructions, is necessary to prevent distributing the bacteria spores throughout your home.